“It is the neglect of timely repair that makes rebuilding necessary,” said English theologian Richard Whately. Not only is rebuilding (or replacing) more expensive than repairs, it also usually takes more resources and more of your time, which most people do not have anymore. And there are some repairs that you cannot do on your own. For this, you may need the services of a handyman in Frisco TX. Handymen have extensive skills in a wide variety of home repairs. These skills include interior and exterior house repairs and maintenance, like repairing a hole in a wall and fixing leaky toilets. But how will you know if you need to hire a handyman in Frisco TX? ⋄ When you cannot do the job on your own. Unclogging a sink or a toilet, changing door knobs, changing a light switch – some home repairs are easier and simpler than the others. Most of the time, all you have to do is follow some instructions provided. However, when you are not confident that you can do it yourself, maybe it is a good time to consider hiring Frisco Handyman. ⋄ When you are confident in your ability and could do the repair but simply do not have the time. Most of us do not have much leisure time anymore. Waiting until you get some free time to get things done could result in the neglect or non-completion of the repair work. This is especially true for full-time working parents. The home improvements you want and the repairs you need can be easily done by Frisco Handyman. ⋄ When you absolutely need a professional to do the job. Everyone deserves to live in their dream house. Getting professional help when doing home improvements is wise and hiring Frisco Handyman can get the job done fast, at an affordable price, without compromising on quality. ⋄ When you need a remodeling done. Kitchen and bathroom remodeling is a large project and is typically not something you would want to do on your own. Redesigning a room (or other space) in your house is often very complex. There are many things to consider, including the materials and designs. Some of tasks you can do on your own. For the more complex work, it is advisable to have professional help. 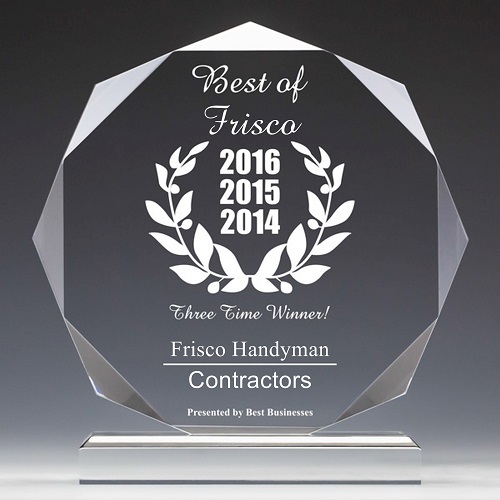 Rest assured, your redesign and remodeling job will be in good hands with Frisco Handyman. ⋄ When you want to free yourself from hassle. Some areas of your home are not comfortable to work in – small crawlspaces and cramped tight spaces. And, what about your attic or outdoors? The hot and humid summers like those we have in Frisco Texas should not prevent you from getting the repairs you need or the home improvements you want done. There is always the option to hire Frisco Handyman who will gladly do the work for you. There are many advantages to hiring a good handyman – make sure you choose only the best. It is also vitally important to communicate well with your handyman and clearly spell out what you want done in order to ensure that the job gets completed properly. Do not be afraid to ask questions – at Frisco Handyman, we believe in keeping you involved and updated at all times.